Between the late 1970s and the early 1980s, Nayra Atiya gathered the oral histories of five Egyptian men: a fisherman, an attorney, a scholar, a business- man, and a production manager. Through personal interviews over the course of several years, Atiya intimately captured the everyday triumphs and struggles of these young men in a rapidly changing Egyptian society. These tender stories of childhood experiences in the rural countryside, of the rigors of schooling, and of the many challenges in navigating adulthood shed light on both the rich diversity of Egyptian society and the values and traditions that are shared by all Egyptians. 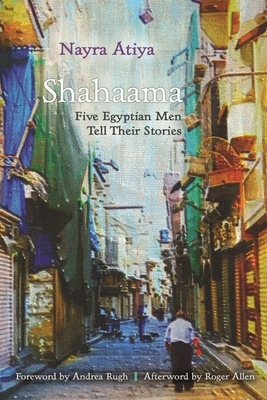 The concept of shahaama--a code of honor that demands loyalty, generosity, and a readiness to help others--is threaded throughout the narratives, reflecting its deeply rooted presence in Egyptian culture. Moving beyond leaden stereotypes of the oppressive Middle Eastern male, these candid self-portraits reveal the complexity of male identity in contemporary Egyptian society, highlighting the men's desires for economically viable lives, the same desires that fuel the many Egyptians today working toward revolutionary change. Nayra Atiya is an American oral historian, writer, and translator born in Egypt. Her book Khul-Khaal: Five Egyptian Women Tell Their Stories won a UNICEF prize in 1990 and has been widely translated.